If you live near one, come August it’s impossible to not think that the American National Park system is fatally flawed. 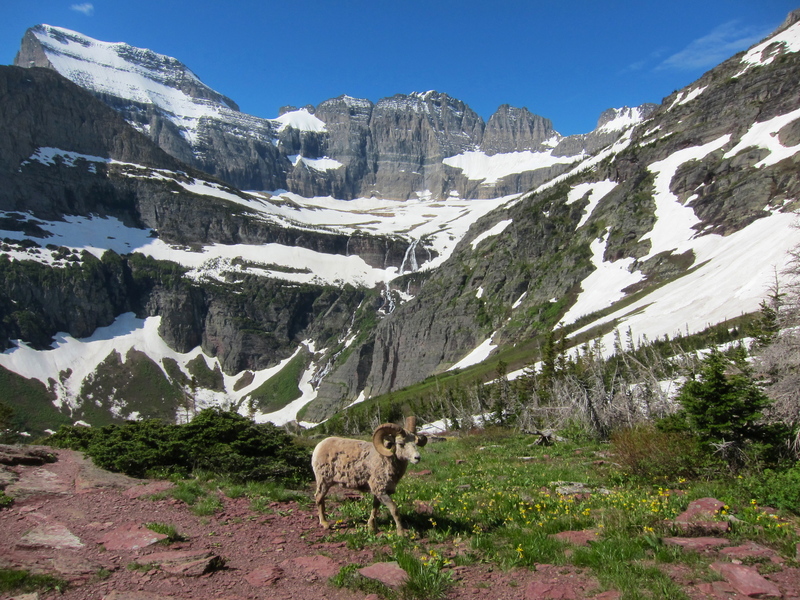 Glacier National Park, our backyard, gets around 2.5 million visitors a year. I’ve not seen a month-to-month parsing, but my guess would by that well over 80% of those folks come in the 2.5 months between the end of June and the second week of September. Yosemite, which is more popular and during the height of winter a lot more accessible to the non-ambitious visitor, gets around 60% of its roughly 3.5 million visitors in the four month of June through September. Zion National Park is a bit more popular than Glacier, and has 90% of its commonly visited sights easily accessible 10-11 months a year. It sees a comparable approximately 60% of its visitors in a five month window, May to September. I choose these three parks because they are all quite large, and all quite popular, and all have the overhwelming majority of their traffic focused into the quite smaller percentage of their land which can be seen from a paved road, or very close to it. The most relevant point here is that it is impossible for so many people to be crammed into a small space, while dealing with the ambiguity and complication of a new and overwhelming place, and still behave themselves. Summer visitors to national parks do things, as a matter of routine, which they would never imagine doing at home. They stop in the middle of a busy road to take photos. They take photos of banal items, like signs and deer. They wear peculiar clothes. They feed cracker jacks to squirrels and mountain goats. They take photos with iPads, often tripping over things, and occasionally in the process falling into streams and over cliffs. They are loud; in voice, manner, and metaphysical proximity. They are rude; to families, strangers, themselves, and most egregiously the workers who give them directions, take their parks passes, and serve them coffee. Humans in national parks during the height of the summer season show everyday humanity at its langorous and unintentional worst. Much though I try not to believe it, these tourists are not contemptabile people. Indeed, back home they not doubt behave much as I do while immersed in the familiar routines of daily living. I must believe that they behave as they do because they cannot view a national park as home, or indeed as part of the real world. The combination of so much unaltered and spectacular, inhuman nature combines with the absurd rules and crowds of the national parks to form an un-save situation in which sane (or to use a more accurate term, normal) behavior would in context be quite insane itself. This is the most compelling argument for a greater breadth of human-powered activities in national parks. The idea of national parks is not struggling for relevancy on a theoretical, or even on a policy level, but on a visceral one. A lot of outdoor neophytes come to parks enthusiastic, or at least curious, and I would suspect leave disappointed. The reward which comes with an involved backcountry traverse should not be dumbed down, as there is no substitute for the satisfaction of a skillset cultivated over a decade, but too many visitors experience national parks as little different than Disneyland, and anything which might help them break through to the other side of the wall will for the future be of benefit. Anything, that is, except that which would (as the Organic Act says) negatively impact the preservation of the parks, for future generations. Its hard to have a productive conversation about this, because of the normative judgements which come hard and fast. An understandable state of affairs, as most everyone talking about this has a high level of personal investment, but not particularly helpful. Even Hayduke himself recently penned one of the more hackneyed works on the subject, largely it would seem due to his own anger at what seems like a growing cultural disengagement with wild places. The most helpful response here is not to close the portcullis, run up the flag, and man the gates. If we cannot look at the history of the national parks and see, from George Bird Grinnell through TR, Bob Marshall, and indeed Abbey and Peacock, that personal experience with the wilderness (lower case) is a prerequisite for substantive action. The tendancy amongst the establishment over the last 40 years, as wisdom and perspective has shown how much has been lost alongside that which was gained, has been to save what is left by freezing the status quo, at all costs and against any change. This ideal has the virtue of simplicity. It also makes any future a rather bleak affair, by removing any politcal dynamism from what are otherwise the most creative parts of the world left to us: those places where we have the least influence, over small and large scale changes. On a personal level Mr. Peacocks intentional hyperbole in the above essay can be excused. As policy, he has done himself and his cause a great disservice, as well as striking a ringing blow against intellectual honesty and for the current climate of political hysteria. Thus far I’ve been conflating American National Parks and wilderness. Lower case wilderness is land where human influence is only visible on a secondary, or more remote, level. It can be, but is not necessarily, the same as juridical Wilderness, which is protected by the aforementioned law. There is in the US today wilderness which is not deemed as Wilderness, and Wilderness with very little wilderness left. Often this last contradiction is due to nothing more than size; in a world of the internet and interstate highway, wilderness demands a certain size so that it may well and sufficiently exceed the artificially augmented human imagination. This is the primary importance of wilderness, and of the National Parks. Modern humans often need a vehicle of introduction and interpretation in order to become acquainted with wilderness on a visceral, intelligible level. The primary mission of national parks, and of Wilderness, is to preserve venues so that this may be possible in the future. The secondary mission is to facilitate this introduction. These questions, and others, should be resolved with exclusive reference to the above balance. Personal, aesthetic preference has no place here, because there is too much at state. * Does anyone really think Bob Marshall notched up all those 40 mile hiking days just so see could see more trees? Or that John Muir climbed volcanos and peaks merely so he could see over the next ridge? Extra-pedestrian intimacy with the wilderness has always been best served by extraordinary exertion. Were he around today Mr. Marshall would ride a mountain bike, and he would not ride it for only 20 miles a day. Hah, we’re on the same train of thought. Posted that last comment and then immediately found the answer in this post. Good stuff. Well said. Responsible backcountry use is the solution to Disneylandification or turning the park into a Museum exhibit. Brilliant essay Dave. It is a pleasure to watch you evolve as a writer, thinker and outdoorsman. Your writing provides me with optimism for the future of wilderness and opportunities to experience it. Catching up on a particularly nice run of posts, thanks Dave. I have long found this sort of opposition to extra-pedestrianism / “adventure” sports / what have you / puzzling, particularly as I have sympathies in both camps. But reading Peacock’s essay, I wonder if (beyond the obvious and not-to-be-discounted issue of aesthetics) part of his ilk’s fervent opposition to changing modes of wilderness travel is rooted in a perceived lack of vocal, eco-centric conservationists among the younger generation. E.g., someone with the ideology of Peacock or Abbey or Foreman who also happened to like, say, fat bikes, and was a reasonably prominent figure in both movements. Instead, I think it’s easy to get the sense from the outside that rhetoric among these cohorts stops short at discussing “playgrounds” and nice views and sick singletrack, without the more traditional load of wilderness / biocentric values someone like David Brower (who was, of course, a pioneering ski mountaineer) professed to accompany the passion for recreation. Whether or not this is true is another issue, as is whether such ideological purity is a good thing for cause at all, and maybe we still need a couple decades before the practitioners of these relatively young sports take up the mantle, but it did get me thinking that perhaps this was part of the communication divide. I imagine you’re quite right.